The competition can fuhgeddaboudit, when compared to this week’s Featured Onepager. 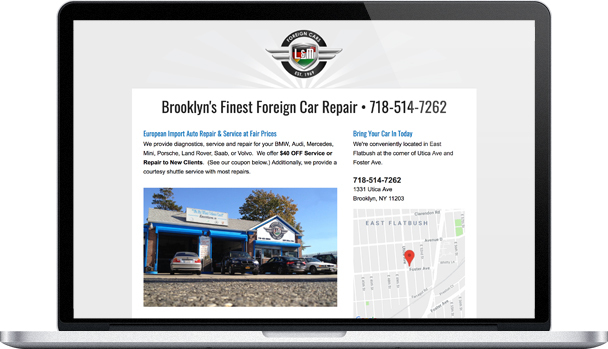 L&M Foreign Car Service has been repairing Brooklyn’s finest foreign cars since 1969. The attention to detail and quality that L&M Foreign Car Service brings to their work, shines through in their Onepager! At the top you can see their logo front and center, which includes both the German and Italian flags: indicative of the origin of the cars they service. In the upper half of the page, you can clearly see their contact information and location. L&M has embedded a google map with their location pinned, so it is easy to get directions on either your computer or mobile device. Beneath a quick summary of the cars they service and a sunny photo of their shop, they give a little history about the business that has been family owned and operated since they first opened. 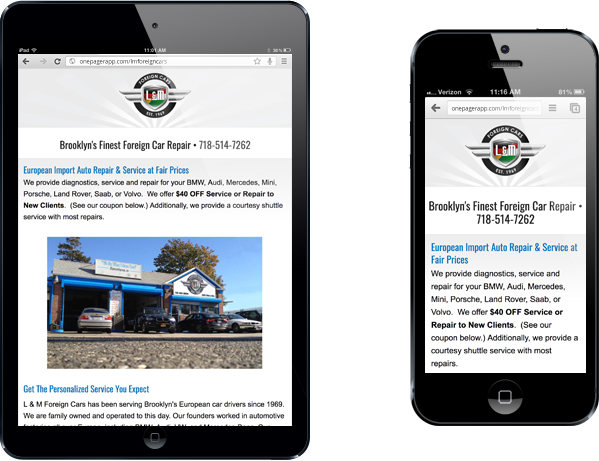 The grey background with blue and white accents on their site echoes the colors of the shop itself, which are reminiscent of earlier days and the brands of the cars they service. They also include a photo of the early days at the shop, as a testament to their heritage and experience. Just below are links to reviews and comments from their satisfied customers, and if you still weren’t convinced that L&M Foreign Car Service is the best in the business, they offer a coupon to first-time customers, right on their Onepager. Congratulations, L&M Foreign Car Service, on a website that is firing on all cylinders!